Krishna Iyer is no more. He has left behind us a rich legal legacy worthy of emulation. He was undoubtedly one of the greatest judges and legal experts that the world has ever produced. He was a great soul. His soul was in anguish for the millions of ‘Dharithranarayanans’ of the country. He was guided by Jerome Frank’s theory that courts in a democracy do not belong to lawyers or the judges, but they belong to the people. Throughout his career as a judge, he stuck to this ideological base and his judgments bear open testimony of this unique stand. A profound legal scholar, a prolific writer, a bold innovator, a powerful spokesman for social justice and Nyaya Panchayath system, Justice Iyer also strengthened the public interest litigation system that became instrumental in restoring the confidence of the people in the Indian judiciary. He was also a great philanthropist, a man who considered the whole world as his native land and all the people as his relatives. Justice Krishna Iyer gave new orientation to the justicing process and innovated what he often referred to as ‘Poverty Jurisprudence’ or ‘Dalit Jurisprudence’. He regarded law as an instrument of social engineering, a powerful tool in the hands of the society for the purpose of reaching social justice to the common man. He always held the ‘little Indian’ in his mind and whatever he did or said judicially or otherwise was directed solely towards improving the living conditions of the large masses of people in the country suffering from want and destitution. He was not constricted or fettered by any traditional or conventional approach. He was prepared to break loose from artificial constraints imposed by the judges themselves on the basis of foreign jurisprudence. He wanted law and the judicial process to meet the challenges of the future, to become an instrument for the realization of the hopes and the aspirations of the people. In that pursuit, he liberally used Directive Principles of State Policy as code of interpretation to construe the constitution and the laws and was fully successful in his mission. Any socially conscious judge, especially in a country like ours, needs to be resourceful, versatile, and experimental, in relating human problems to a complex background of modernity and tradition. In Krishna Iyer’s judgments relating to death penalty cases, one can notice his passionate belief in the goodness of man, his intense humanism and his firm conviction in the potential divinity of every human being. Frankly speaking, the sentencing process got illuminated by his innovative interpretative approach. As a crusader for social justice and human rights, his heart revolted against any form of injustice or exploitation and he ceaselessly tried to wipe the tears from as many eyes as possible and bring cheer to the hearts of his fellow beings. Krishna Iyer developed prison jurisprudence and humanized prison conditions. He openly held that bail and not jail should be the watchword of the criminal justice system. Right to legal representation at State expense in the case of indigent accused was placed to the status of a Fundamental Right by his progressive interpretation of the constitutional rights of the accused. The scope of right to silence and the prohibition against self-incrimination during police interrogation got articulated to the advantage of citizen’s interests. That apart, prison labour, prison discipline and prison administration also received civilized and humane touch, as part of the correctional jurisprudence developed by him. Prisoners and jail birds owe much to this great benefactor. No longer will they have to rot in jails under degrading and inhuman conditions nor suffer the torture of iron bars or chains. He always said that though judges are appointed and not elected, they are as much accountable to the people of India as the legislature and executive. He nurtured the firm view that the constituency of the judges is the people of India and the judges can never forget their primary accountability to the people. He evinced the combination of passion for humanity and high legal technique and in this he was like the great jurists of our legal tradition, Coke, Mansfield, and Denning. His judgments are often cited worldwide and drawn upon for their wisdom. Justice Iyer was always a seeker after justice, one who was uninhibited by the judicial mantle. There are only few judges of the Supreme Court of our great country who occupied the permanent place in the mind and soul of the people. They are those who changed the streamline of courts. Undisputedly, the first among them is Justice Krishna Iyer, a socialist, a humanist, a progressive and an activist judge. Throughout his life he never compromised with power. He joined the oppressed classes of the country and waged a war against superstitions, prejudice, and irrationalism and adopted and practiced scientific temper and a rational approach to life and its problems. An ardent pleader of Swadeshi Jurisprudence, he was not averse to receiving light from whatever source. As a social revolutionary, he was at perpetual war with traditional attitudes. A Judge is exalted as law giver and prophet in the temple of justice. It is said a Judge must have the wisdom of Solomon, the moral vision of Isaiah, the analytic power of Socrates, the intellectual creativity of Aristotle, the humanity of Lincoln and Gandhi, the impartiality of the Almighty. Measured by these scales of expectations and qualities, truly speaking, Justice Iyer was an ideal judge. Krishna Iyer justified judicial activism on the score that it strengthens Indian democracy, particularly when the courts are spurred by the conviction that legislative processes and administrative agencies have failed to bring society closer to the meaning of its constitutional values. He transcended the domain of jurist or a judge of law and became a Sage of law who has given us some clear vision of what the Laws should be, and are going to be, in the coming future. Krishna Iyer was a human wonder. He was a man of passion dedicated to the downtrodden and toiling masses and at the same time had an extraordinary commitment to the discipline of jurisprudence. His sublime dedication was to truth, to compassion and to justice for the common man and woman. He extended juristic principles to the utmost in the service of the people, and this is discernible from his immense contributions in the areas of Industrial jurisprudence, Public health jurisprudence, Environmental jurisprudence, Human rights jurisprudence, Family law, legal aid and public administration. He belonged to the rare brand of thinkers, with an analytical mind with piercing intellect. Whatever is the issue, political, social, economic or legal he brought on them a measure of clarity, originality and objectivity. He was the guardian of the poor, the indigent and the workers. He fearlessly defended the poor by his assertion that to be poor is not a crime. In his desire to render justice for the poor and downtrodden, he revolutionized the judicial process by introducing epistolary writ procedure. 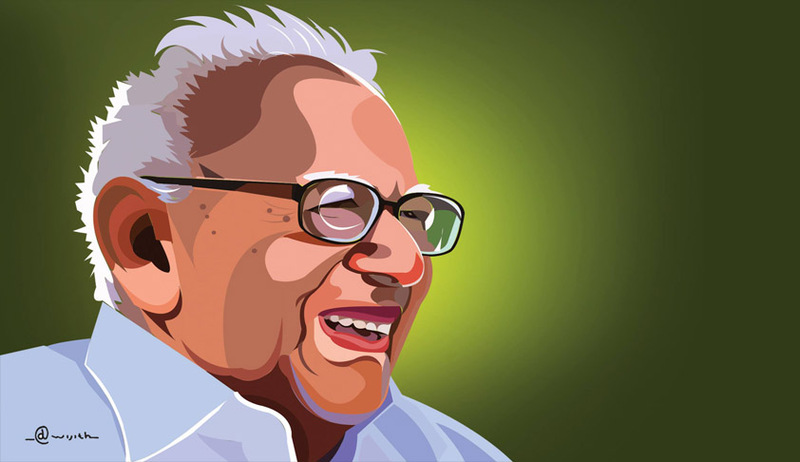 Though Krishna Iyer has departed from us, he will always be remembered in the heart and mind of every little Indian for his significant contributions to the law and society. As homage to the great soul, let us all strive to build the Bharath that he envisioned; the great India that he longer for; where unity, fraternity, peace, harmony and prosperity permeates at all levels transcending religious, linguistic, regional and sectional diversities. Dr. Pauly Mathew Muricken is an Advocate practising at High Court of Kerala.